The EI-ADO studies provided many useful insights into value chain development opportunities, the incentives for technical, product, and process upgrading along whole chains, and identifying key research gaps. The Synthesis reports draw together the main findings from all EI-ADO value chain studies, with a special emphasis on lessons and implications for government, the private sector, development projects, and donor agencies. A series of brief reports have been prepared, synthesizing the main findings from all EI-ADO value chain studies. The reports emphasise the key learnings from the studies and outline the implications for government, the private sector, development projects, and donor agencies in general. More specifically, the reports include a comparative analysis of value chain conduct, export and important patterns, spatial patterns and growth patterns of the various commodities researched. Powerpoint presentations of the Synthesis Report were delivered to the AIP-PRISMA team and later to a Government of Indonesia workshop. These presentations present graphically the issues covered in the brief reports. 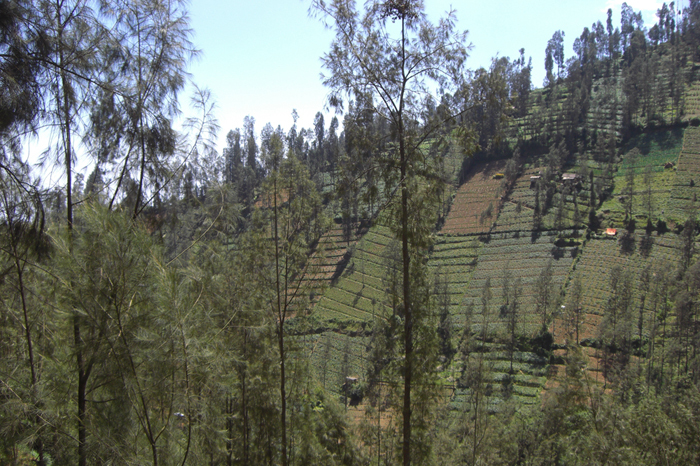 Vegetable production on steep slopping farms in Bondowoso, East Java. Potato farmers in the region are contracted by Indofood to supply potatoes (Atlantic) for chips.